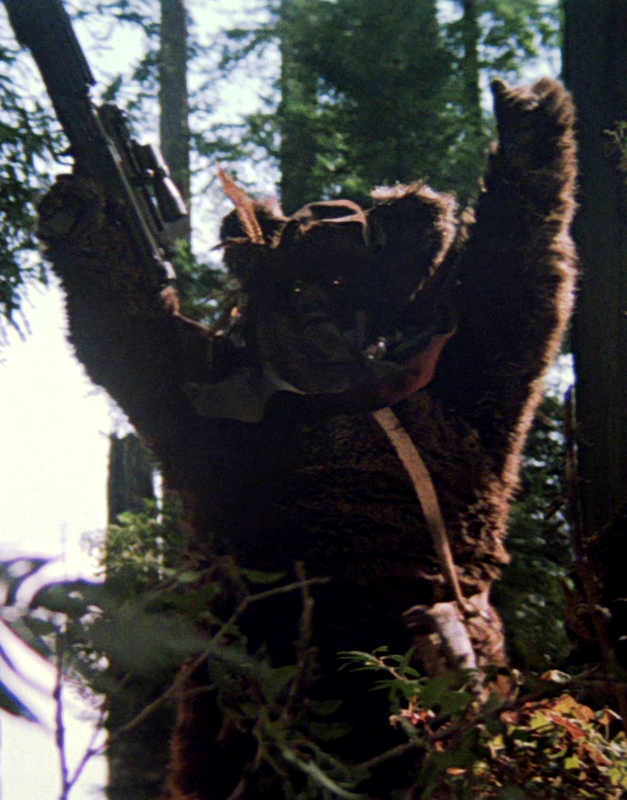 Every time I watch Ewoks: The Battle for Endor I laugh as the movie begins. I can’t help it. You see, in the first minutes of the film, as the opening credits and music are playing, we see three things: a gorgeous meadow on the forest moon of Endor, an Ewok skipping with a little girl, and the same Ewok picking flowers for that little girl. What an opening!!! And then, all of a sudden, the laughter stops and things get really absurd. An Ewok village is raided by marauders; the little girl’s brother, mother, and father are killed by said marauders; and she, her Ewok friend (who turns out to be Wicket), and all the Ewok villagers are taken captive. What a way to start a movie for kids!!! Okay, lets back up for a second. For those of you who are unaware, after Return of the Jedi came out in 1983, the Ewoks were a pretty big deal. Little kids loved them. Of course they did, Ewoks reminded them of their teddy bears. So, riding this wave of popularity, Star Wars creator George Lucas released two made-for-TV movies about the Ewoks. The first, in 1984, was The Ewok Adventure: Caravan of Courage. The second, Ewoks: The Battle for Endor, was released in 1985. Both were nominated for a couple of Primetime Emmys and both won the Primetime Emmy for Outstanding Special Visual Effects. An Ewoks cartoon series was also released, and would air two seasons from 1985-1987.The main Ewok protagonist of them all: Wicket W. Warrick, the same Ewok who discovers Leia in Return of the Jedi. Alright, here is the deal: the movies and the cartoons are really fun (and somewhat ridiculous), and originally I was going to write about all of them at length for this week of Ewokery. Buuuuuut I really just want to talk about The Battle for Endor. Why? Because it. is. awesome!!! Don’t get me wrong, I enjoy them all but when I was a kid, I wore out the VHS we had of Ewoks: The Battle for Endor. I watched it so much that I am pretty sure the VHS broke. Thank goodness for DVDs and YouTube! So it is this point in the post I am going to tell YOU to go watch Ewoks: The Battle for Endor if you haven’t already. Now, Caravan of Courage does take place before it, but you don’t HAVE to watch it to understand what is going on in The Battle for Endor. And, because I am so good to you all, I have provided a YouTube link to the movie all over this post so you really have no excuse. In the meantime, if you want to wait, or if you happen to be at work right now and can’t hide the fact that you are watching a movie when your boss walks by, I will just share some more little nuggets about the movie that I enjoy or that are just outright ridiculous…or both. Along with Caravan of Courage and the cartoon series, The Battle for Endor is part of the Star Wars: Expanded Universe (now called Legends). All take place BEFORE the events of Return of the Jedi which means that at some point Wicket somehow forgot how to speak Basic (English) by the time he is poking Leia with his spear in Return of the Jedi. Another fun EU fact: the little girl, Cindel Towani, she doesn’t just show up in Caravan of Courage and The Battle for Endor. She is ALSO a minor character in Tyrant’s Test, one of the novels in The Black Fleet Crisis. Speaking of characters, in The Battle for Endor (but NOT in Caravan of Courage), Cindel’s father is played by Paul Gleason. You might recall Mr. Gleason as the principal in The Breakfast Club. 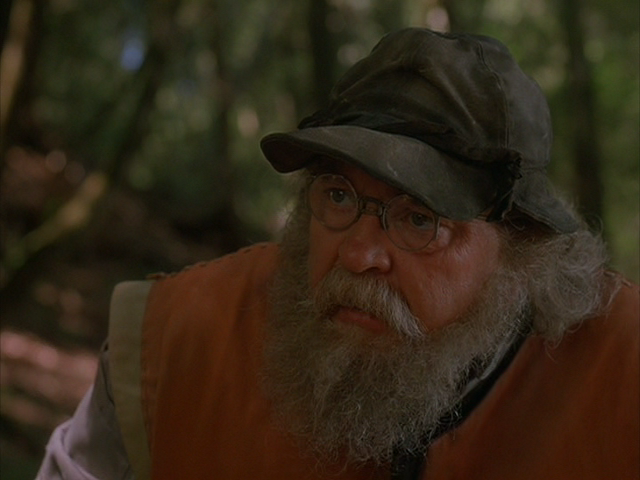 The primary male lead in the film, though, is played by….drum roll…Wilfred Brimley! Brimley plays a character named Noa who flips between being a mean old man, and a tender old man, in most of his early interactions with Cindel and Wicket. For example, he yells at Wicket and Cindel for building a fire, stating they will burn down the entire forest (never-mind the fact that Wicket is a native and knows what he is doing). Then, next thing you know, Noa has invited them into his home and is building a fire for them in his home’s fireplace. BTW, Cindel and Wicket escape from those marauders right after they are captured, and they find their way to Noa’s home thanks to a curious little creature named Teek. Besides being REALLY fast, Teek is mischievous and funny, but also tender and caring. Honestly, Teek has always been my favorite character in the film. However, I also really love Wicket, mostly because of the strange things he says and the way he acts. Just as Noa flips between angry and tender, Wicket flips between intelligent and childish. In one moment he is showing off his Ewok ingenuity, the next he is is completely helpless having been caught in a trap. Basically, he is the perfect mix of smart and funny, making him easy for little kids to identify with. But what about the other Ewoks in the movie? 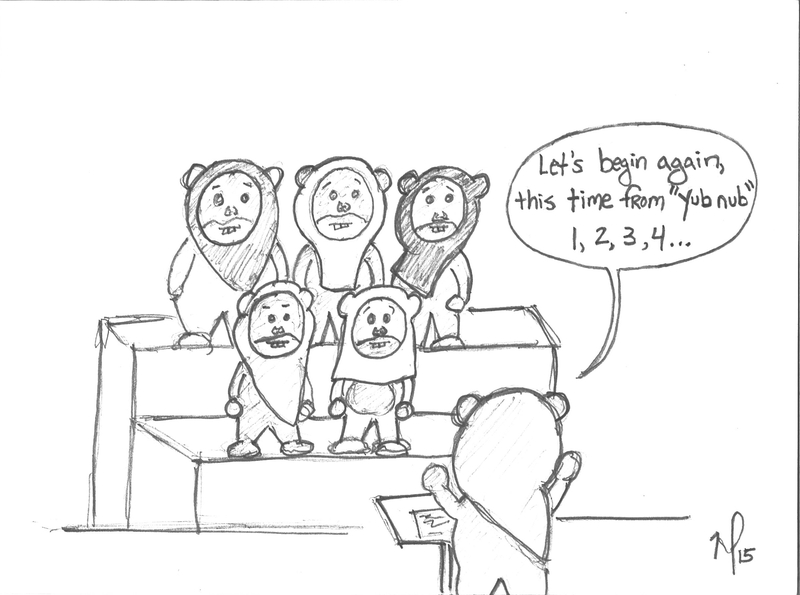 Frankly, the other Ewoks play a very small direct role in the film until the final act begins. I will spare you the full plot summary, but suffice it to say it is in the finale that the Ewoks finally battle for Endor after escaping from the castle they are held prisoner in. Yeah, a castle, in the middle of a very large, rocky plain on the forest moon of Endor. When the battle between the Ewoks and the marauders plays out, what ensues is a visually stunning, albeit completely one-sided fight. You hardly need me to tell you who wins the battle for Endor. 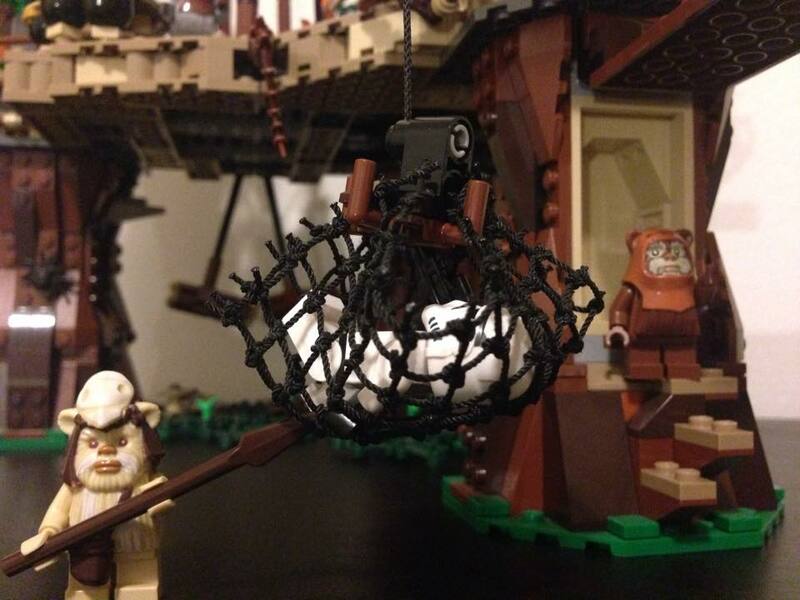 The Ewoks are brilliant in their fight against the bad guys, ranging from tactics that make the marauders trip and fall over, throwing spears at them, and launching explosions from a catapult Noa had sitting around. In fact, the best moment in the fight has GOT to be when one of the Ewoks saves Wicket by launching himself from the catapult, flipping end over end and landing on a baddie. It just doesn’t get much better than that. 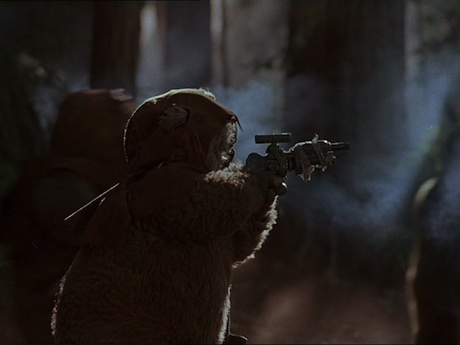 Ewoks on the attack…with guns!!! And with that, I honestly have very little else to say. I grew up loving the movie and I still do. But at this point, I would rather hear what you think about the movie so leave some thoughts in the comment section. And if this is the first time you have seen it, I would love to know what you newbies think! Also, feel free to leave some thoughts on Caravan of Courage and the Ewok cartoon series! I hope you enjoy these Ewok haiku poems submitted by fans of Star Wars and The Imperial Talker. Feel free to email your own Ewok-related haiku if you would like to add to the page! teddy bears armed and lethal. They’d make a nice pet. Have you ever wondered what Ewok tastes like? Well, if you are curious, you needn’t go on a hunting trip to Endor to snag one of those furry creatures yourself. Oh no, just travel to the settlement of Pons Ora on the Outer Rim world of Abafar and then head for the Power Sliders diner. There, the Sullustan Mister Borkus has a number of delicious entrees ready for you to try including his famous Ewok Jerky! You know, I bet you don’t have to travel the whole way to Abafar to chow down on some Ewok meat. Chances are it is shipped all over the galaxy. Heck, if a diner on an obscure Outer Rim world offers Ewok Jerky, some other restaurant in the galaxy probably makes a great Ewok Steak or some Smoked Ewok Ribs. I mean sure, Abafar could be the only location offering Ewok on the menu, but unless Abafar is really close to Endor, it would cost Mister Borkus a fortune to get the meat in the first place. It all boils down to supply and demand. Economics 101. And if you are saying to yourself, “What the heck, Ewoks were hunted and eaten, that is super messed up” I am not going to disagree with you. In fact, given that the Ewoks are part of the Living Force, and are also sentient beings, one has to ask: why in the hell weren’t the Jedi protecting them from poaching and consumption? I will let you ponder this one on your own. 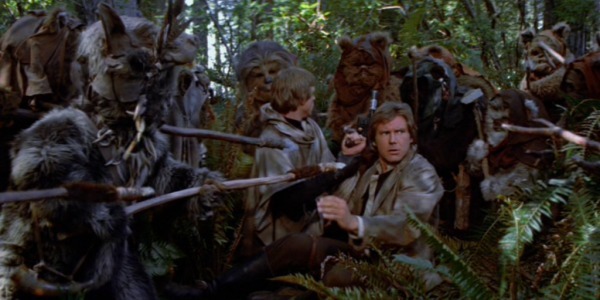 An Ewok hunting party surrounds Han, Luke, and Chewbacca. A final thought, though. 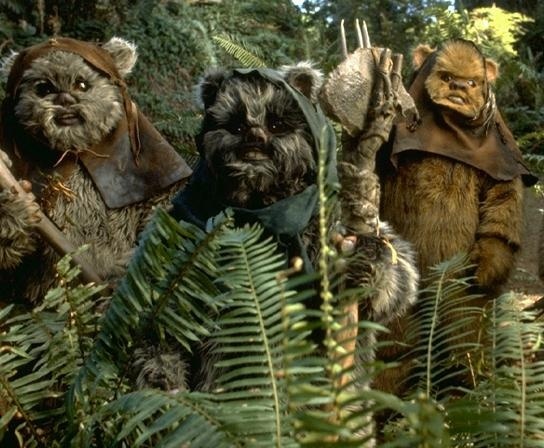 Since the Ewoks were a delicacy on Abafar, and presumably other worlds, then there were surely groups that went to Endor to hunt, capture, and kill the furballs. If so, then this could explain the extreme caution the Ewoks exhibit around Leia, Han, Luke, and Chewie, not to mention the Empire. If they aren’t cautious around outsiders, they could end up on someone’s dinner plate 1,000 light-years away. 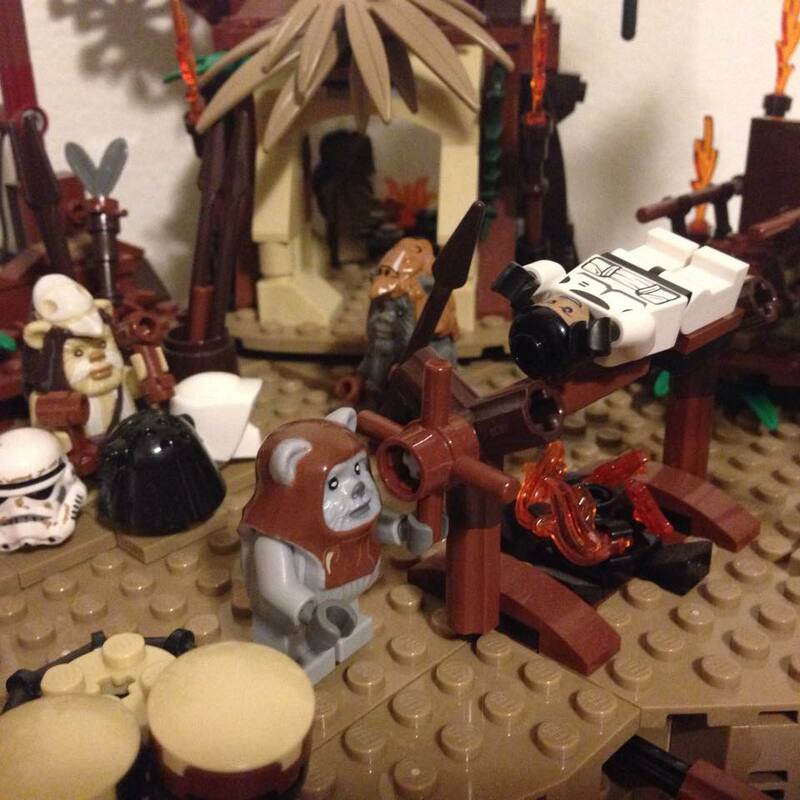 Leave a comment and let me know what you think about the Ewok’s being eaten! Welcome to Ewok Week! Yub Yub!!!! For the entire week, I will be presenting posts ranging from fun and lighthearted to outright disturbing, all dedicated to those furry little creatures from the Sanctuary Moon of Endor who help the Rebels defeat the Empire. Of course, I am well aware that while some of you may love and adore the Ewoks, others of you probably hate them with a passion and think they are a ridiculous part of the Star Wars universe. Knowing these different feelings about Ewoks exist, I asked for people to submit their thoughts on the Ewoks, be them good, bad, or neutral. Having collected a number of submissions already, I will be publishing them in an article titled “Fan Feelings on Ewoks.” And, for those of you who want to contribute to this post, even after it goes live, feel free to send me a paragraph or two with your thoughts and I will include them in the post. 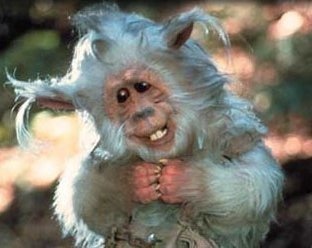 Really, you should all think of Ewok Week as an open forum, an opportunity to engage with not just my thoughts on the Ewoks, but to share your own. So feel free to email me a paragraph, to comment on the posts, to send me an Ewok Haiku or some Ewok Fan Art, and, if nothing else, to just sit back and enjoy the opportunity to think about the Ewoks. 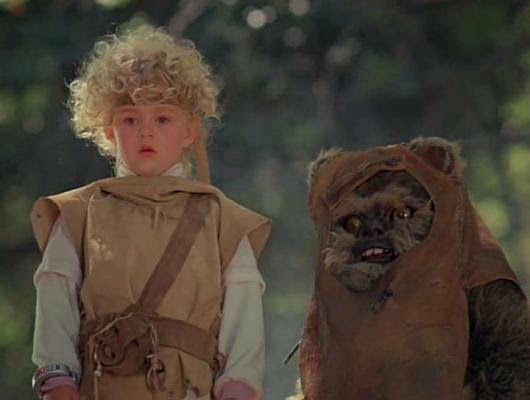 Oh, and one last thing — Ewok Week is the very first week-long series I have dedicated to a particular element within the Star Wars galaxy, it won’t be the last. At the end of the week, I will be asking you to help me decide what the topic for the next week-long series. Starting thinking now about what you might like it to be! 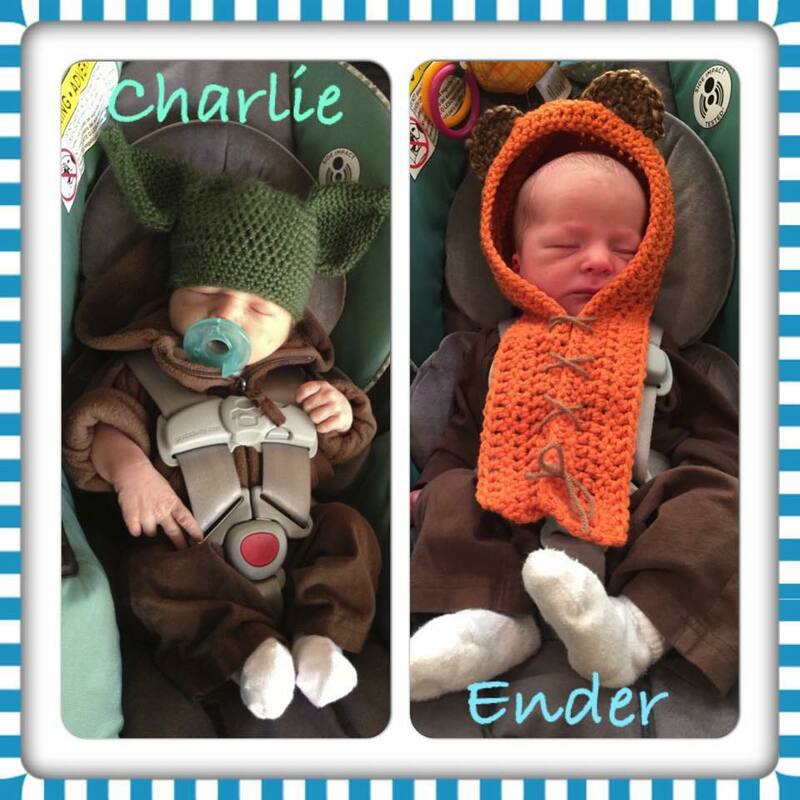 Enjoy Ewok Week and May the Force be with you! Ewok Haiku – Write an original Ewok related haiku and email it to me to post! 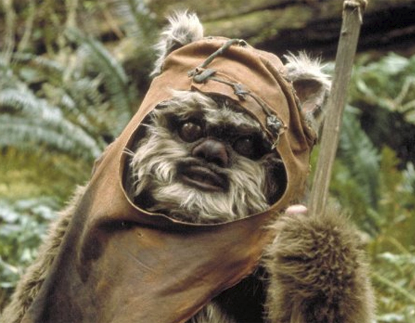 Write a short paragraph about how you feel about Ewoks. Do you love them, hate them, feel neutral towards them? Do you have an idea that YOU want to write about? Let me know and we can chat logistics! Have a suggestion to help me make Ewok Week a success? Fill me in! I am open to any and all ideas. Ultimately, I want Ewok Week to be not about me, but about you, the fan of The Imperial Talker, enjoying a week of fun devoted to a species in the Star Wars galaxy. AND, at the end of the week, I will be asking for your suggestions about the NEXT species I will devote an entire week too on the site. Get ready for some adorable fun coming soon! And in the meantime, start sending me your Ewok art, ideas, and more!